Moving can be stressful, even when it doesn’t include large items of furniture. What do you do when you need to pack up your entire living room? 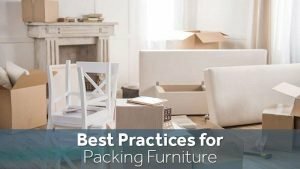 Here are some tips for packing your furniture so it doesn’t get damaged during the transition. When it comes to couches, many large sectionals are held together in bigger pieces by bolts, screws and latches. Other couches often have removable cushions. It’s easier to move any large furnishings by disassembling them first. If you don’t disassemble your furniture, it may move unpredictably when you’re moving it, and that can be dangerous. Dressers are an excellent example of this. If you don’t take the drawers out of a dresser, it’ll be much heavier to move — and the drawers could slide out while you’re moving it. If you can’t get the drawers out, you can tape them in place. When disassembling furniture, make sure you mark any pieces, and if there are any small pieces like screws, you may want to put them in a ziplock bag and tape that bag to the furniture item. Take photos of your furniture to make sure you know how to reassemble them! Corners and legs are the most likely to be damaged when furniture is being moved. You can protect your furniture by taping foam or padding to the corners of anything sharp, such as tables and chairs. The legs of furniture are often fragile and delicate; to protect items like chairs, you’ll need to be careful when packing them up for transportation. When possible, move things like tables and end tables upside down, so they aren’t resting on their legs. When moving chairs around things like corners, you’ll be “hooking” them through so you don’t force them through. You may need to get creative about positioning! One of the major risks when moving large furniture isn’t that you’ll damage the furniture, but that you’ll hurt yourself. Of course, trying to move large, heavy furniture can also lead to damage. You may need to invest in the appropriate tools, which includes hand trucks, pallets and lifting straps. You should always lift large items of furniture rather than drag it, and when lifting large items of furniture, you should have enough people to lift it so that it is not difficult to maneuver. As always, you should lift with your legs and keep your back straight. As you can see, it can be very complicated to pack and move furniture without potentially damaging it, and often it isn’t without risk. If you want to have a pain-free move, you can have the professionals help. Zippy Shell offers long distance and short distance moving services. Contact us at Zippy Shell Greater Columbus today to find out more about our deals.